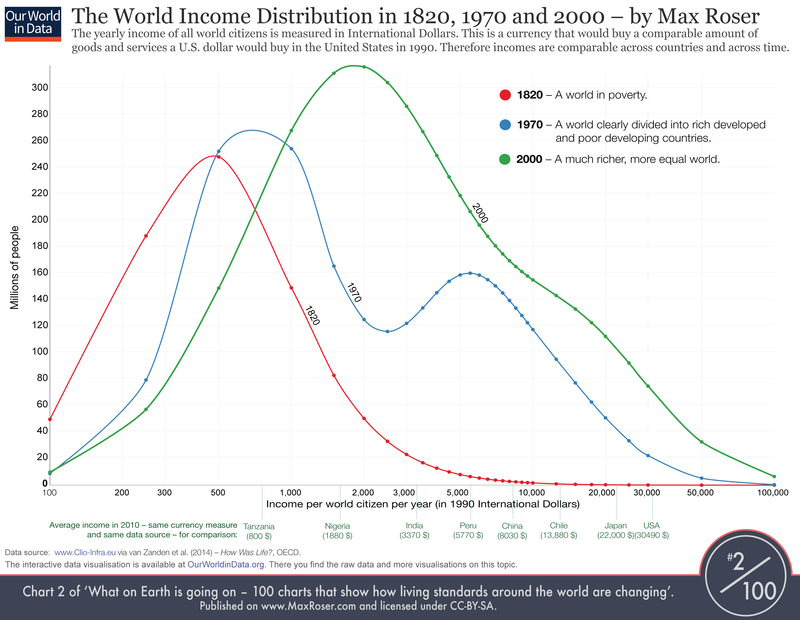 Global inequality today is at a level last seen in the late nineteenth century – and it is continuing to rise. With it has come a surging sense of disenfranchisement that has fueled alienation and anger, and even bred nationalism and xenophobia. As people struggle to hold on to their shrinking share of the pie, their anxiety has created a political opening for opportunistic populists, shaking the world order in the process. The gap between rich and poor nowadays is mind-boggling. Oxfam has observed that the world’s eight richest people now own as much wealth as the poorest 3.6 billion. As US Senator Bernie Sanders recently pointed out , the Walton family, which owns Walmart, now owns more wealth than the bottom 42% of the US population. I can offer my own jarring comparison. Using Credit Suisse’s wealth database, I found that the total wealth of the world’s three richest people exceeds that of all the people in three countries – Angola, Burkina Faso, and the Democratic Republic of Congo – which together have a population of 122 million. To be sure, great progress on reducing extreme poverty – defined as consumption of less than $1.90 per day – has been achieved in recent decades. In 1981, 42% of the world’s population lived in extreme poverty. By 2013 – the last year for which we have comprehensive data – that share had dropped to below 11%. Piecemeal evidence suggests that extreme poverty now stands just above 9%. As Angus Deaton recently pointed out , extreme poverty remains a serious problem in rich countries, too. “Several million Americans – black, white, and Hispanic – now live in households with per capita income of less than $2 per day,” he points out. Given the much higher cost of living (including shelter), he notes, such an income can pose an even greater challenge in a country like the US than it does in, say, India. This constraint is apparent in New York City, where the number of known homeless people has risen from 31,000 in 2002 to 63,000 today. (The true figure, including those who have never used shelters, is about 5% higher.) This trend has coincided with a steep rise in the price of housing: over the last decade, rents have been rising more than three times as fast as wages. Ironically, the wealthy pay less, per unit, for many goods and services. A stark example is flying. Thanks to frequent flier programs, wealthy travelers pay less for each mile they fly. While this makes sense for airlines, which want to foster loyalty among frequent fliers, it represents yet another way in which wealth is rewarded in the marketplace. This phenomenon is also apparent in poor economies. A study of Indian villages showed that the poor face systematic price discrimination, exacerbating inequality. In fact, correcting for differences in prices paid by the rich and the poor improves the Gini coefficient (a common measure of inequality) by 12-23%. The better off also get a whole host of goods for free. To name one seemingly trivial example, I can’t remember when I last bought a pen. They often simply appear on my desk, unintentionally left behind by people who stopped by my office. They vanish just as often, as people inadvertently pick them up. The late Khushwant Singh, a renowned Indian journalist, once said that he attended conferences only to stock up on pens and paper. A non-trivial example is taxation. Rather than paying the most in taxes, the wealthiest people are often able to take advantage of loopholes and deductions that are not available to those earning less. Without having to break any rules, the wealthy receive what amount to subsidies, which would have a far larger positive impact if they were allocated to the poorest people. Beyond these concrete inequities, there are less obvious – but equally damaging – imbalances. In any situation where, legally, one’s rights are not enforced or even specified, the outcome will probably depend on custom, which is heavily skewed in favor of the rich. Wealthy citizens can not only vote; they can influence elections through donations and other means. In this sense, excessive wealth inequality can undermine democracy. Of course, in any well-run economy, a certain amount of inequality is inevitable and even needed, to create incentives and power the economy. But, nowadays, disparities of income and wealth have become so extreme and entrenched that they cross generations, with family wealth and inheritance having a far greater impact on one’s economic prospects than talent and hard work. And it works both ways: just as children from wealthy families are significantly more likely to be wealthy in adulthood, children of, say, former child laborers are more likely to work during their childhood. None of this is any individual’s fault. Many wealthy citizens have contributed to society and played by the rules. The problem is that the rules are often skewed in their favor. In other words, income inequality stems from systemic flaws. In our globalized world, inequality cannot be left to markets and local communities to solve any more than climate change can. As the consequences of rising domestic inequality feed through to geopolitics, eroding stability, the need to devise new rules, re-distribution systems, and even global agreements is no longer a matter of morals; increasingly, it is a matter of survival.